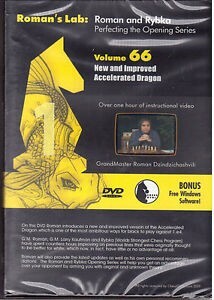 On this DVD Roman discusses a new and improved version of the Accelerated Dragon, one of the most ambitious way for Black to play against 1.e4. Roman, Larry Kaufman and Rybka (the World's Strongest Chess Program) have spent countless hours improving on lines that were previously thought to be better for White, but which now in fact have little or no advantage at all. Roman will also provide the latest updates as well as his own personal recommendations.